I enlarged it too Pam, and I have to say it’s given me a better understand of shading…really!!! You are a teacher even when you don’t know it..eheheheh!! !love ya!!! oh..i love the idea of a black paged journal. that is such a beautiful look! 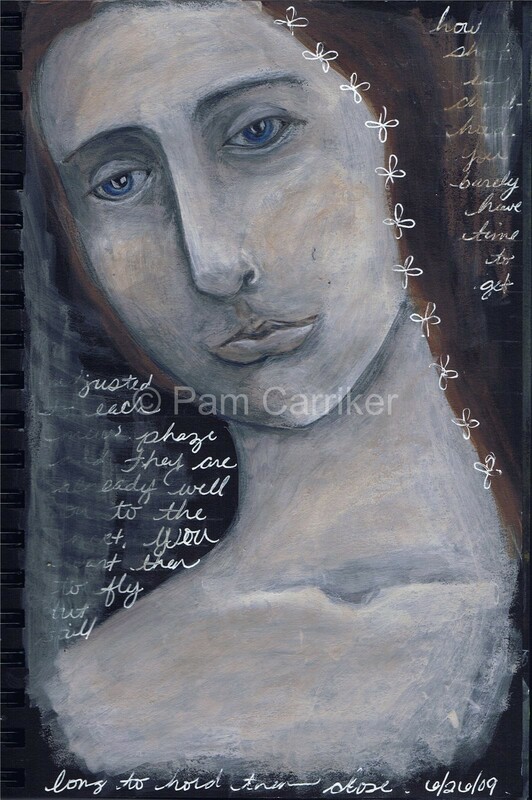 Pam, absolutely one of my favorites… a very different spin for you on the black page which I truly love…cannot wait to see more! love the art, love the journal, very cool. it gives it a surreal effect. I am trying to finish up a journal so I can start a new summer one next!! I just enlarged it to look at it. Pam, that is fabulous. Stunning, beautifully done. It reminds me of the masters actually.Congratulations on this one. Pam you are amazing. All the ideas in your head rushing to get out on paper. I love the crayons and blending them with matt gel or Flotrol for a fabulous, transparent effect. I’ve never seen a black pad before, that must be something new? it’s just amazing what you can do with crayons, my dear 🙂 Simply gorgeous !!! !